A Business Process Management (BPM ) Center of Excellence (CoE) helps accelerate BPM implementations while avoiding past mistakes by centrally coordinating and leveraging the core functions of skills, governance, artifact repository and BPM community. However, establishing a CoE need not be a huge initial undertaking. For example, an informal CoE with only the key roles populated can emerge concurrently with an initial BPM project, and then gradually build to include the full set of skills and roles required to quickly implement strategic and high-impact BPM programs. Research shows1 that without a CoE, BPM initiatives are more likely to be disbanded after the first project, or stagnate at the project level, never achieving the synergies required to move to a higher level of business process maturity. 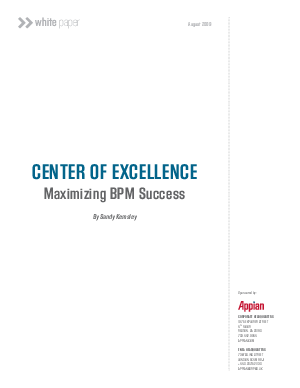 This white paper examines the business case for a BPM CoE, the required components, and the expected value. It also includes a case study of how an investment management firm's CoE evolved from informal to strategic.